Meet the Wishbone. 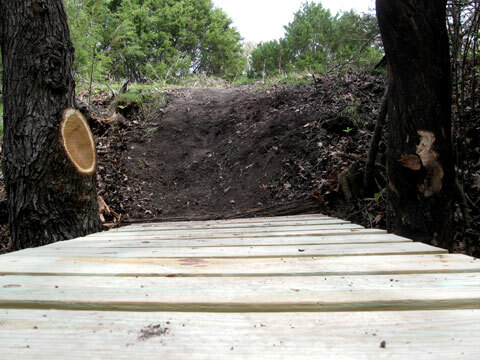 one of the new features for the Spring of 2009. Over the winter, things have been busy on the Solavaca. 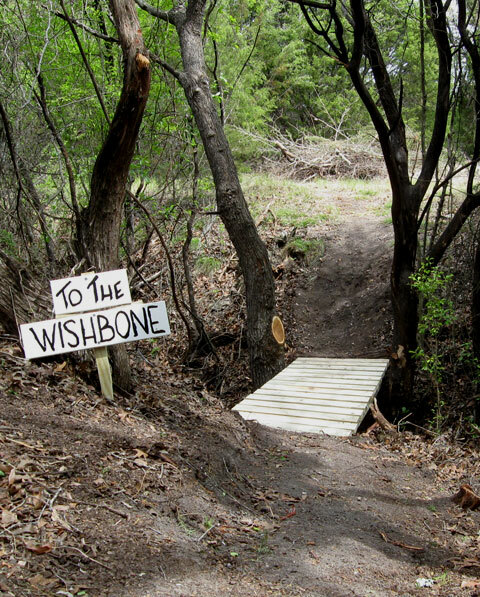 The WishBone is a very short little diversion that is located in the Ruidoso area and gives you one last moment of “Yipes” before you head for the bridge and close out the loop. When you climb out of the feature called Root Hog ‘r Die, you can see the entry to it on the right just near the top of that short climb. 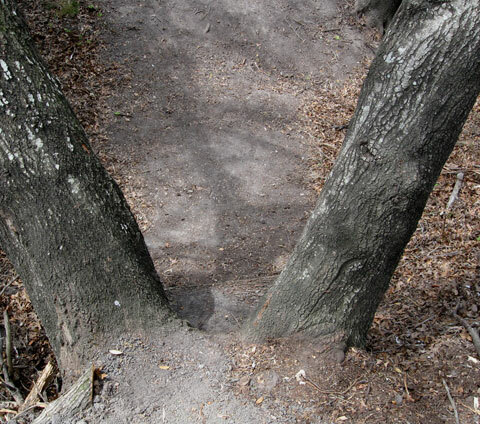 Down and across the short bridge, quick left curve, and you see the trail point you right through the WishBone. I hoped that I could safely navigate the scary dropoff on the way over the “bone” but despite my calculated plans, I crashed and my new bar ends ripped my shirt beyond repair. It also left some scrapes and bruises but nothing at all serious. After that, I added an 8″ log on the step-down side. Joel, the wrench from Bikes inc in Fort Worth did that and it looked like he just barely avoided a somersault even with that there. So I added a 14″ log, the 8″ log, and a 4″ log in succession. I think the visual as you approach will still make you wonder if you came to the right place, but with a reasonable amount of technique and proper weight distribution, you should live to ride again. This little parlor game is the 5th project to be added over the Winter and the early Spring out here. In the first one I enlisted the help of the Weatherly family – Jeff, Diana, and Kyle. They had proved their mettle by helping me remove lots of tree limbs just before the race last November. I was glad they volunteered to help clear the way for the nice, straight, fast, downhill at the bail-off end of the Culo de Gato hill. You can go the old slip, slide, twist, and pray way – now called Hair Ball or you can veer left for the Cat Nip way down. It flows very steep and fast to a short terrace, then off that to the flat and a gosh-I-love-disc-brakes decelleration into a right turn. Back up the the terrace level and you rejoin the old trail bed. Then Diana Weatherly, needing to get her PayDirt and her SuperDude hours, came out for 3 weeks straight to help me with the next new section. If you recall the L’il Pucker, you remember that you climb out of the hollar and turn left? Not now. You go straight , continue the climb, and level out for some nice woods trailing, eventually coming out going downhill and headed for the first creek crossing. That adds some nice variety and about 1/10th of a mile. Next at marker 14, after you do that little ascent, the trail now goes left, back down to the rim of the creek for some tricky dipsy-doodle, a winding forest path and then on to Starr Bux. BTW, this location is NOT closing even though several riders have been caught on tape leaving without paying. Starr doesn’t like that. Not good. I digress, but that new part adds about 1/10th also. Then back to the Weatherly trail support team for a section that I have wanted to do for a long time. A very pretty part of the ranch is on the upper creek along the high banks of the east side. Jeff, Diana, and Kyle helped me hack, rip, and dig that beautiful trail along the creek on the south end. 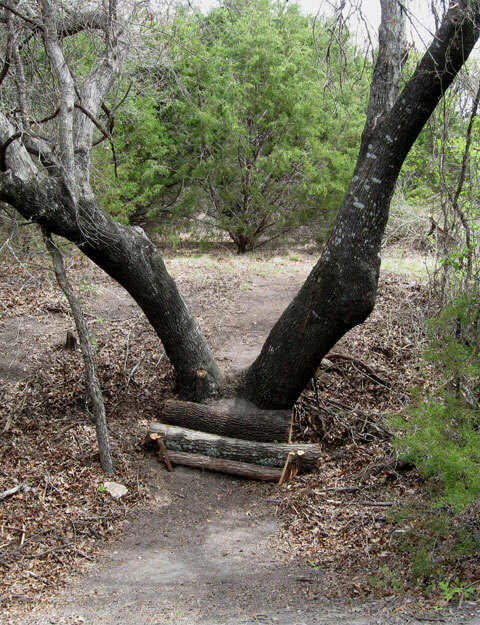 As you are about to leave the CatClaw zone, you hit a new opening in the trees labeled Upper Creek. It takes you south a ways, then into a u-turn and then along that high bank all the way back to the sign that announces Blue Stem. It is not technical but it is a very nice ride over some land that was really thick and inaccessable before. Adds 4/10ths. When the creek flows, this will be hard to ride without stopping and looking at the scenery, You can drop your bike for a few minutes and hang your feet in the cold water. But you might not want to finish the ride. All this except the WishBone is already well traveled and many of the Solavaca Sentries have ridden it by now. If you haven’t, then you are lucky because you will get to see it all at once. Aren’t we lucky to be mountain bikers. 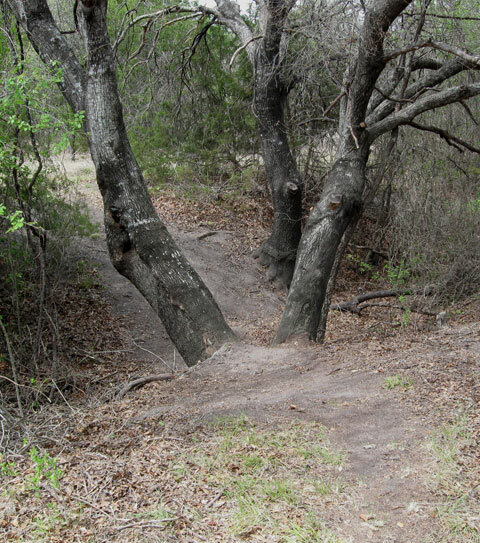 Aren’t we lucky to be mountain bikers in North Texas? I plotted my strategy, committed to the plan, and…crashed. With better skills I could make it clean, but to enjoy the feature, I needed to make one more modification. So I did. The exit is a little friendlier. I’ll try it today. It works now. I rode it twice and didn’t carry enough speed to get out of the ditch the first time. Second time, I got wobbly coming out but made it.